jitspoe wrote: You might consider switching to A*. Dijkstra explores all possible waypoints and can be expensive. A* is a bit smarter, so it can be a big performance gain if you have a lot of points. Your data structures will likely be different, but maybe the logic will be a worthwhile reference. I'm still new to pathfinding, but IIUC, the issue here isn't 'how to (optimally) find the shortest path from node A to node B', but 'how to determine which node is node B'. It's all about correctly determining the cost to find B, actually. In the example you showed, a blocked waypoint should represent a HIGHER cost than the not so close but visible alternative. frag.machine wrote: It's all about correctly determining the cost to find B, actually. In the example you showed, a blocked waypoint should represent a HIGHER cost than the not so close but visible alternative. Yes, the thing is, in this situation .. how can WaypointA realise that it's NOT a valid wp from which a bot can reach the owners.origin? Just to clarify (in case I'm not explaining myself clearly): currently the bot successfully navigates the nodes and ends up at the final waypoint. The final waypoint is always one that is the closest and has 'line of sight'. This would be fine if the bot needed to attack, but in this case I want the (friendly) bot to navigate itself to the owner's position. The blue line is the path the owner took. 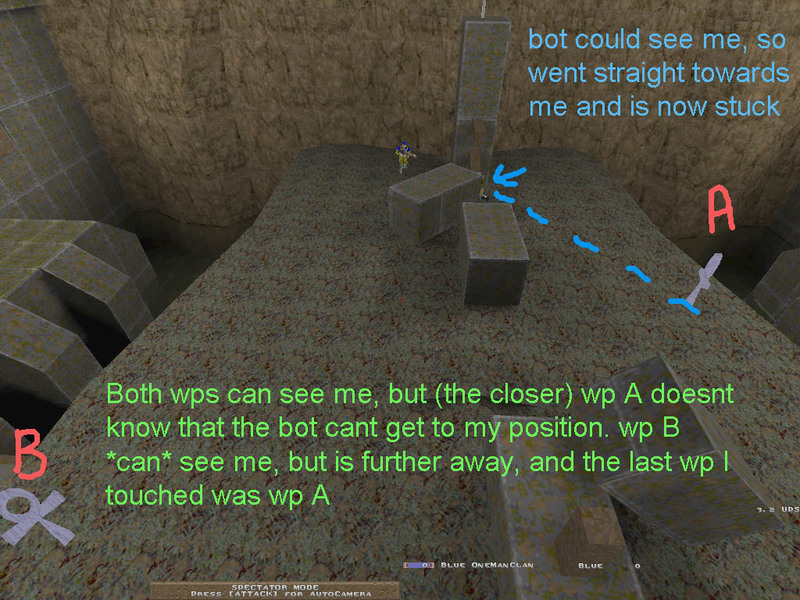 The bot is standing at the last wp the owner touched. Once the onwer is in the position shown, the command goes out "come here, bot", but from the bots current position he cant reach me. Pretty sure in that screenshot, there should be a jump or rocketjump waypoint over the obstacles between a and the player, there should also be a waypoint at or very NEAR the player. From that waypoint, there should be a path to b, between the obstacles, and to a. The scenario you show appears to just not have enough waypoints. 2 waypoints for that screenshot is an absurdly small number. was the Omicron bot source ever released? Because they are really smart. but they are not really "portable" to other engines. ofc its easier to copy/paste frikbots, but i like to make my own bots. In this example, there isn't. 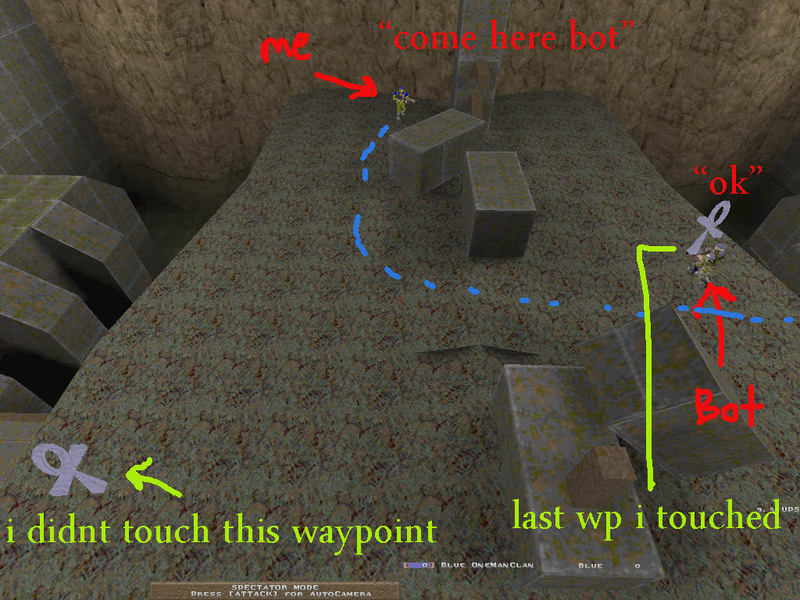 The current logic is: if(the bot gets stuck) UseWaypoints() - and current ai returns A as the 'final waypoint'. gnounc wrote: there should also be a waypoint at or very NEAR the player. The thing is, even if there was, in an open area such as this, it's easy for the owner to follow the blue path and not come into direct contact with any waypoint. During my testing, I've has to switch waypoint visibility on, so could see the waypoints and intentionally walk into them. This can't be normal. gnounc wrote: From that waypoint, there should be a path to b, between the obstacles, and to a. The scenario you show appears to just not have enough waypoints. 2 waypoints for that screenshot is an absurdly small number. True, I've tried to use as few as possible, only put waypoints such that players always have a direct line of sight to one. Maybe that's not enough in certain environments. Yes, I can see how this works with the waypoints on narrow paths (where a player MUST touch them, but what about (eg) the one on the bottom right, on the floor? Q1: How do the ai Gurus ensure that waypoints detect players in open spaces? (or is 'just make more waypoints' the solution? Hmm .. I'll try more waypoints, and report back. Thanks for the feedback! ps is there any reason ppl don't make waypoints of different sizes? To make sure they are triggered in large areas? touching is stupid. make a sea of waypoints and then just find the nearest. This is a common problem with waypoints in general, especially with complex geometry. Ultimately, I think I'm going to do away with them completely and try to use something more along the lines of a navmesh (or some similar system tied into the geometry of the map).